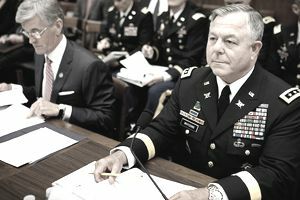 Acting as something of an internal watchdog, the Army inspector general routinely investigates allegations of misconduct by Army officials at the rank of colonel or below. Their primary role is to investigate complaints of waste, fraud or abuse that violate Army rules and regulations. These soldiers like to think of themselves as the Army's conscience, keeping an eye on the day-to-day and making sure everyone follows the rules. It's also important that soldiers and civilian Army employees know they have a place to report smaller infractions which don't rise to the level of a criminal investigation. Complaints can be filed by soldiers, their family members, retirees, former soldiers or civilians working for the Department of the Army. The office also can be directed to investigate allegations against senior officers at the rank of general, as it was in the 2004 Abu Ghraib prisoner abuse scandal. The position of Army inspector general was created by George Washington to improve the training, drills, discipline, and organization of what was then the ragtag Continental Army. The office still fulfills that role by monitoring compliance; for example, it inspects the Army's chemical- and nuclear-materials systems. The self-described mission of the Army Inspector General is "to inquire into, and periodically report on, the discipline, efficiency, economy, morale, training, and readiness throughout the Army." While it investigates internal issues, it's not accurate to consider this agency totally independent. It does not report to Congress, but to the Secretary of the Army and the Army Chief of Staff instead. The IG’s office has only limited subpoena authority; it cannot, for instance, subpoena civilian witnesses. The agency has reviewed cases involving soldiers injured or killed by friendly fire. It has handled sexual-harassment complaints. And it has produced reports on alleged abuses against detainees by in . It does not handle criminal investigations, which it leaves to the U.S. Army Criminal Investigations Command. These soldiers receive their training at Army Inspector General school. The general rule is that soldiers and Army civilian employees should report any instances of waste, fraud or abuse with their supervisor or commanding officer in the immediate chain of command. Such complaints can be brought to the Army Audit Agency, or in the case of criminal activity that the inspector general's office does not handle, to the Army Office of Special Investigations. To file a complaint, contact your local or .